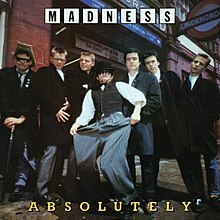 Absolutely is the 1980 second album from the British ska band Madness. The album reached number 2 in the UK album charts. "The Return Of The Los Palmas 7"
Absolutely spawned some of the band's biggest hits, most notably "Baggy Trousers", which peaked at number 3 in the UK singles chart. "Embarrassment" reached number 4 in the charts, and the instrumental song "The Return of the Los Palmas 7" climbed to number 7. Although the album reviews were generally less enthusiastic than those of One Step Beyond..., they were mostly positive. Robert Christgau gave the album a favourable B- grade, but Rolling Stone awarded the album just one out of five stars. Rolling Stone was particularly scathing of the ska revival in general, stating that "The Specials wasn't very good" and Madness were simply "the Blues Brothers with English accents". In 2009 and 2010, Madness re-released their entire back catalogue of studio albums until 1999's Wonderful with a bonus CD and extra tracks. The re-release of Absolutely has seven bonus tracks plus an additional CD featuring a 1980 concert recorded at the Hammersmith Odeon. The album is named after one of the oft-said expressions of the band's then tour manager and sound man Tony Duffield. The front cover sees the band standing in front of Chalk Farm tube station in Camden. When the original vinyl was released the first, more sombre, cover photograph was changed to a more animated pose after around 10,000 albums were pressed. The two sleeves can be distinguished by Mike Barson's holding of the umbrella: in the earlier pressing he holds it up to his chin while in the later, and subsequently used, releases the umbrella is on the ground. The inner sleeve features a London Underground-style roundel for a railway station called "Cairo East" on one side (this roundel later reappeared in the video for "(Waiting For) The Ghost Train") and a history of the group on the other. 6. "On the Beat Pete"
8. "Take It or Leave It"
14. "The Return of the Los Palmas 7"
In 2009 and 2010, Madness re-released their entire back catalogue of studio albums until 1999's Wonderful with a bonus CD and extra tracks. Cathal Smyth (Chas Smash) – backing vocals, trumpet, lead vocals on "Solid Gone"
^ Erlewine, Stephen Thomas. "Absolutely – Madness". AllMusic. Retrieved 17 July 2015. ^ a b Christgau, Robert (1990). "Madness: Absolutely". Christgau's Record Guide: The '80s. Pantheon Books. ISBN 0-679-73015-X. Retrieved 17 July 2015. ^ a b c Marcus, Greil (19 February 1981). "Madness: Absolutely". Rolling Stone. Archived from the original on 12 October 2007. Retrieved 17 July 2015. ^ Considine, J. D. (2004). "Madness". In Brackett, Nathan; Hoard, Christian (eds.). The New Rolling Stone Album Guide (4th ed.). Simon & Schuster. p. 508. ISBN 0-7432-0169-8. ^ a b c "The Madness Timeline: 1980". Archived from the original on 28 September 2007. Retrieved on 19 June 2007. ^ "Smash Hits magazine March 31 – April 13, 1983 page 10". ^ "Media Control Charts". charts.de. Retrieved 18 September 2013. ^ Steffen Hung. "New Zealand charts portal". charts.org.nz. Retrieved 14 October 2011. ^ Steffen Hung (15 June 2006). "Norwegian charts portal". norwegiancharts.com. Retrieved 14 October 2011. ^ Steffen Hung (7 October 2011). "Swedish Charts Portal". swedishcharts.com. Retrieved 14 October 2011. ^ "UK Singles & Albums Chart Archive". Chart Stats. Archived from the original on 3 June 2009. Retrieved 14 October 2011. ^ "AllMusic". AllMusic. 16 September 2011. Retrieved 14 October 2011.